You may have noticed a different look to my blog today. I was having major issues with my last blog theme, so I spent last night trying to fix it and I am not technical, at all! The only option I had, was to change my blog platform (not fun). Currently this is now a work in progress, so please forgive the mess. I do plan on trying to fix my blog to look pretty, but during my free time. I want to do some cooking this weekend and recipes come first! If anyone knows of a good blog designer please let me know. Now for today’s recipe. Today I have for you, what I call the traveling bread! This bread has had its photos in the kitchen, outside and finally the front room. I just couldn’t find a location that was good enough. It makes me crazy not having my perfect spot, which isn’t exactly perfect but seems to work. 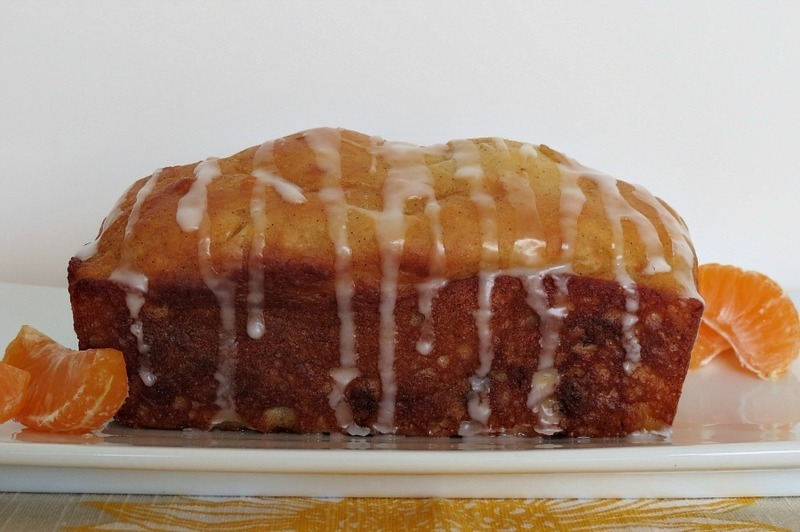 This is my Vanilla Bean Orange Loaf Bread! 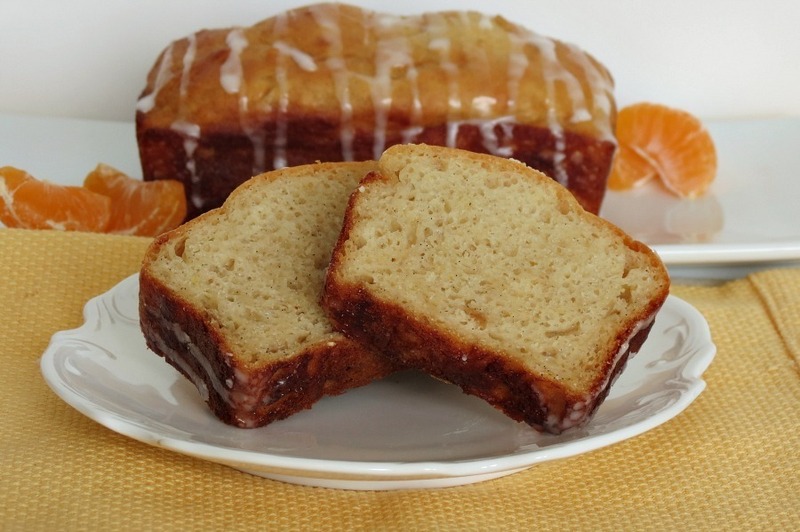 This bread is kind of a combination of a typical quick bread and a pound cake. I found it to be a little more firm then quick bread and the texture reminds me of pound cake, which is A-OK in my book!! It has a wonderful orange flavor and I love the little specks of vanilla bean. This was the first time I ever baked using a real vanilla bean! I’m such a vanilla freak, I also added vanilla extract to the bread! In my opinion you can’t have too much vanilla! So yummy! I wanted the bread to have a little more omph than plain orange flavored bread, so I decided to put on a sweet sugar glaze over the top. I asked my Husband what kind of glaze he wanted and he opted for orange. I added a little splash of orange extract to powdered sugar, a pinch of milk and whisked together an oh so sweet glaze. It’s finger licking good! Yes I licked some of the glaze. Don’t judge me, you know you do the same! 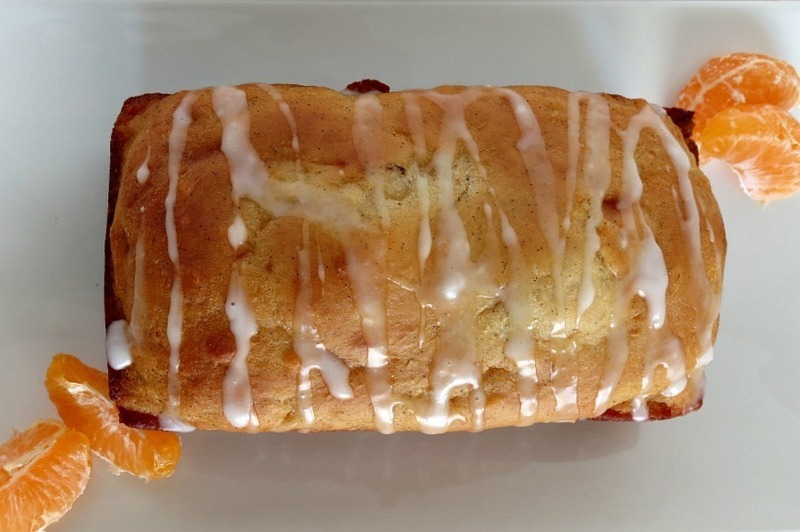 An orange flavored quick bread made with freshly squeezed orange juice, vanilla bean paste and topped with a sweet orange glaze. Grease 1 large loaf pan or 3 mini loaf pans with cooking spray; set a side. In a medium bowl, mix yogurt, coconut oil, sugar, egg whites, vanilla extract, orange extract, juice of the orange, orange zest and vanilla bean paste; mix until until blended. In a separate bowl add flours, baking powder, baking soda sand salt. Mix together. Spoon batter into a greased 9- x 5-inch loaf pan or 3 mini loafs. Use the back of the spoon to smooth batter out. Bake for 50 minutes to 1 hour for 1 large loaf or 30 – 35 minutes for 3 mini loafs, or until a wooden pick inserted into center comes out clean. Cool in pan on a wire rack 10 minutes; remove from pan to wire rack. Once bread is cooled, in a small bowl mix powdered sugar, orange extract and milk. Mix until combined and drizzle over the bread. To scrape the vanilla bean; cut the bean down the middle, carefully pull the sides apart and take the back of your knife to scrape out the vanilla paste. You can throw your scraped bean in sugar for a vanilla sugar taste. Monday: Readers Choice, Top 10 Recipes for 2012 – You picked them! 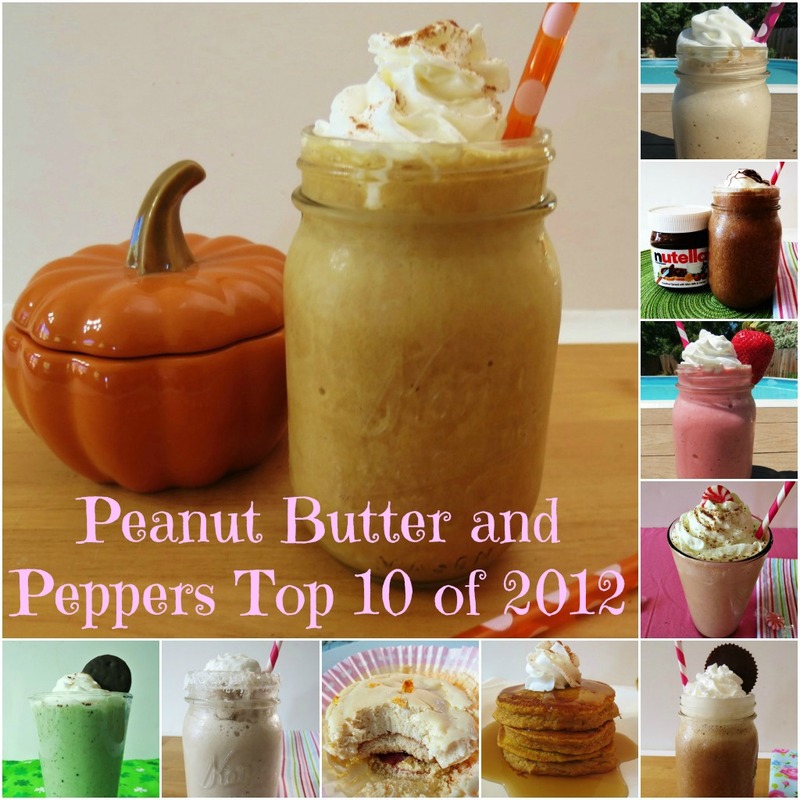 The top ten recipes of 2012! I must say you guys really like those Frappes!!! Tuesday – Rise and Shine Smoothie – This smoothie sure perks you up in the morning. I love the two-tone color. It’s so tropical!! 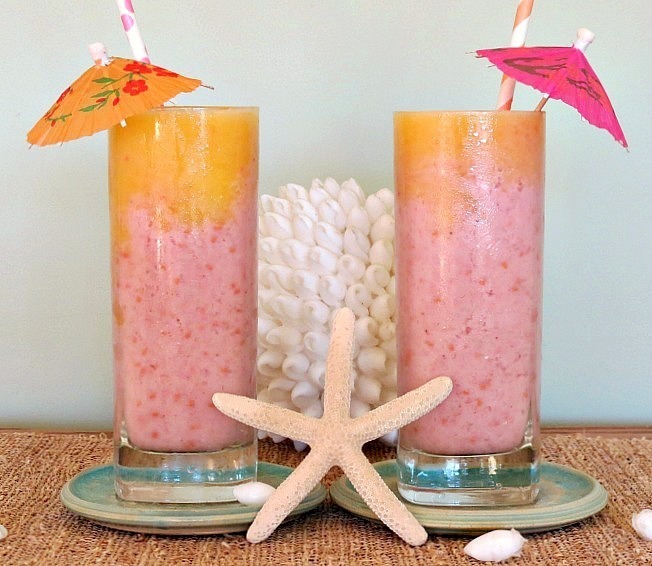 This drink is made with pineapple coconut milk, orange juice, raspberries and banana! Yum!!! 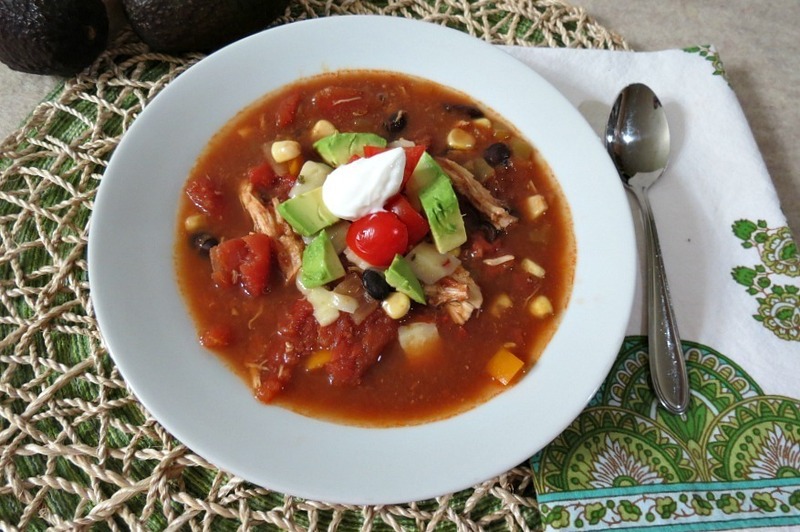 Wednesday: Southwestern Chicken Soup Revamped – I love this soup! I wasn’t kidding when it’s in my top three favorites! It has a wonderful Mexican flair, chock full of beans, chicken, corn and ohhh the Enchilada sauce to it is a perfect addition. 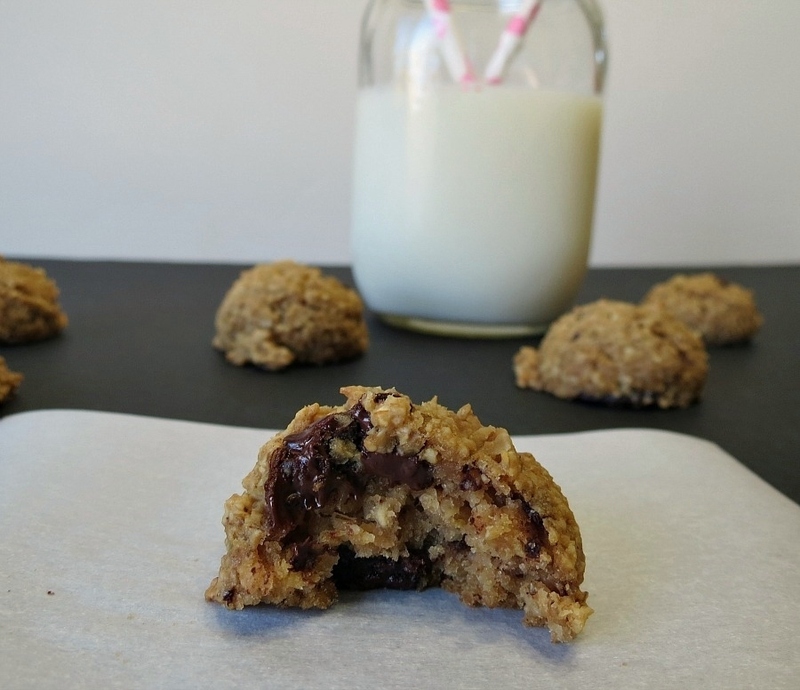 Thursday: Healthy Oatmeal Chocolate Chip Cookies – I’m pretty stoked about these cookies! They are fantastic! I’m so loving the little chunks of dark chocolate in them! They are completely healthy and guilt-free. What more can a girl ask for? 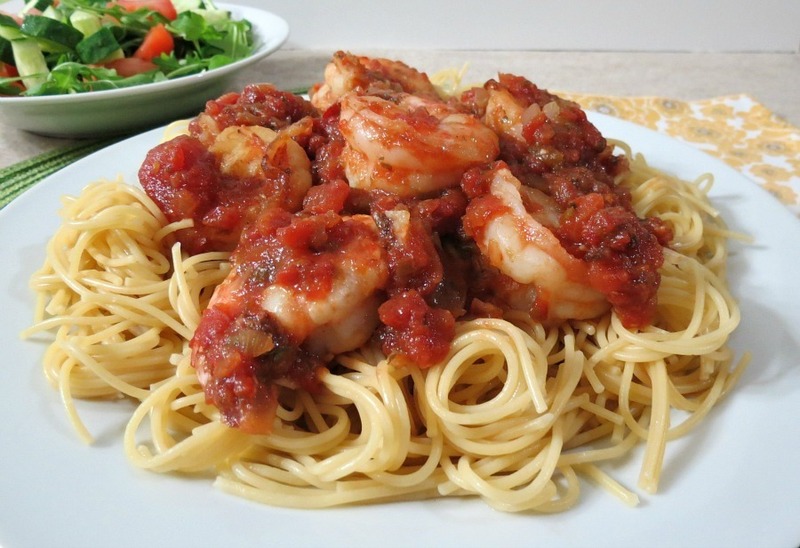 Friday: Tomato and Wild Blue Shrimp Pasta – This is a fantastic dish and looks like you spent more time on it, then you actually did! I love simple dishes like this. So full of robust flavor and big chunks of juicy shrimp!! I am so getting hungry now! Well my Friends, that is it, seems like a short week. I feel like I”m missing a day. Hmmm? Well anyway, it’s getting late for me and I must be going! Time for me to make some din din! P.S. 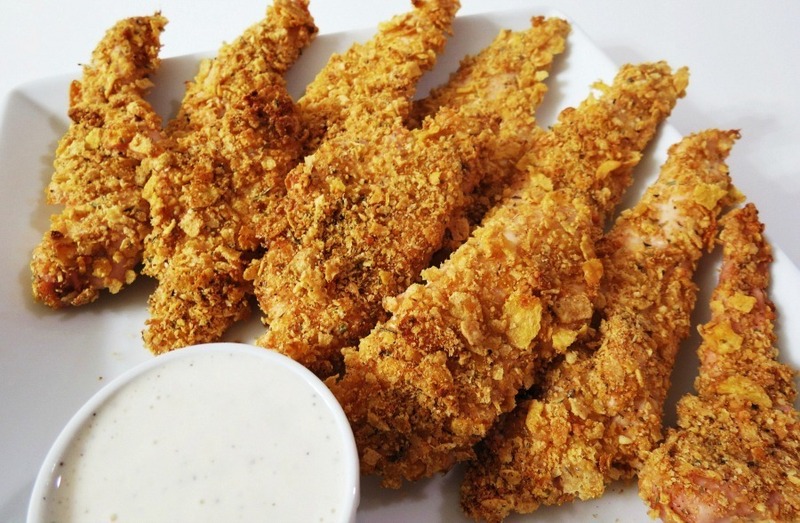 This weeks craving is Cornflake Breaded Chicken Fingers. Hi Jen! Do you think you could substitute applesauce for the orange juice? Hi Libby, the orange juice is for the orange flavor, but you could sub the orange juice for applesauce. It should still taste great. Maybe add a pinch more orange extract. Jennifer – I actually like the look of your blog today. The white background has a clean look and it came up quickly. Previously, the page took longer to pull up than other blogs, but this one came up right away. Thanks for all you do. I’ve gotten some of my favorite healthy/skinny recipes from you and have found favorite products that I wouldn’t have otherwise known about. Really? You like the white background? Thank you!! I tried to make the page clean, I’m glad to know it loaded faster!! Thank you so much for letting me know, I appreciate it!! And I appreciate your kind words, thanks Beth! Have a wonderful weekend!! I so want a slice please!! Hi Jen I agree much faster to load the page!! Wondering if the nutritional info is with sugar or the nunatratl? Thanks for letting me know about the page view. The calories are with NuNaturals, but I updated it with sugar. It’s only 9.9 grams and the calories went up a pinch, but still good, especially for a sweet quick bread. Page loaded way faster for me today and I like the easy to read white background. I just happen to have the ingredients for this bread so it will be on the baking agenda this week. Oh yah! This is so good to know! Thanks!! Oh yum Jennifer! I can’t wait to try the orange bread! Thanks!! If you try it Debbie, let me know what you think! Have a great week! I just love how you dont need a bread maker to make this! Me too! 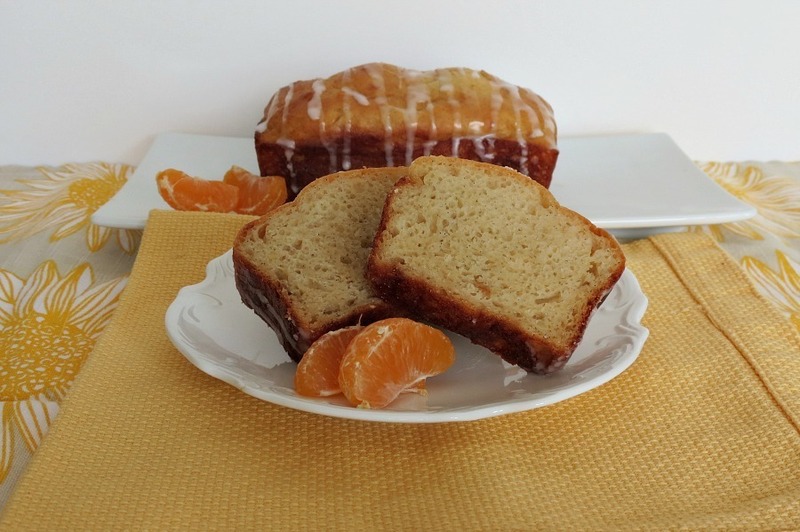 I love quick breads, because, well they are quick and easy!! This bread is making my mouth water! Very moist and delicious looking. Love anything with orange! I just found you! Love the recipes! Many thanks!